All of my “snacks” that I have posted are lunches I regularly eat. 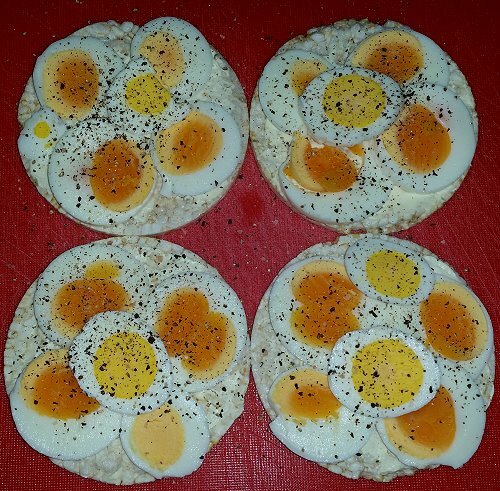 Those snacks take time to put together – especially if one has to boil the eggs first. 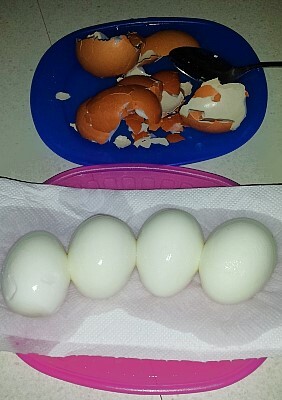 I have got into the habit of boiling eggs regularly at night so I have them ready to peel for the next day. There are some days when I just feel like nibbling on stuff for lunch. So this is what I normally put together when that happens, though I might swap out one of the items for something else – eg pickled onions for olives, or apple for carrot sticks. 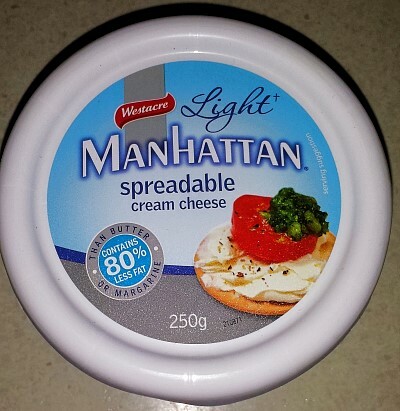 I might add some hummus or spicy capsicum dip to eat with the crackers. I might swap the vintage cheddar for feta. 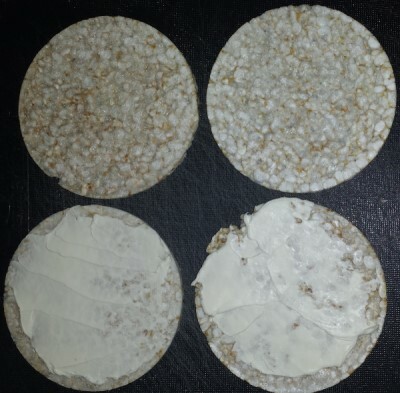 Thus far on Snoskred Snacks, we have exclusively used rice crackers. 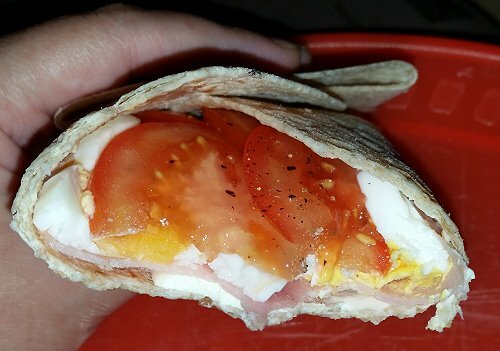 I was looking for a lower sodium option to replace bread on some occasions for The Other Half and we have been trying out some different wraps recently. I found one that I really like for myself, and I found a super low sodium one by Mountain Bread which The Other Half quite likes. 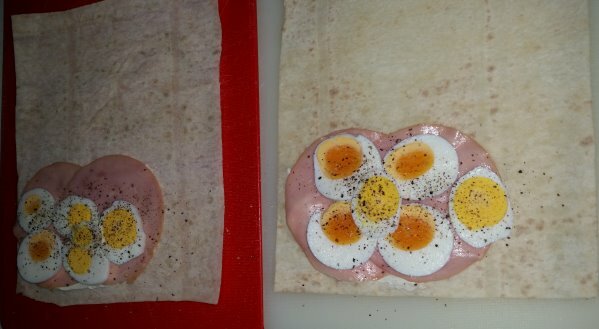 Today, I will tell you the story of my ham, egg, cream cheese and tomato wrap with salt and pepper. So first you add cream cheese, then layer on some ham. Here you see I have begun the next step which is adding eggs – yet another double yolker from Manning Valley! I added in an egg from our girls as well, and salt and pepper. 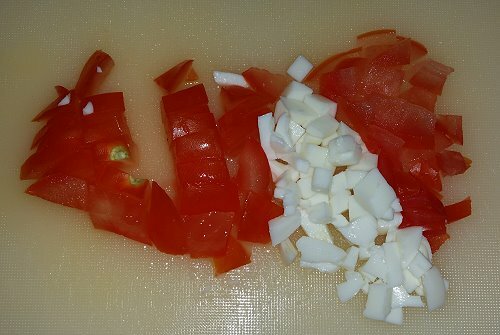 The final step – layer on the tomato. I like to fold in the sides and then flip up the bottom. These stayed together pretty well, there was no dripping and no splitting. Happy moments! 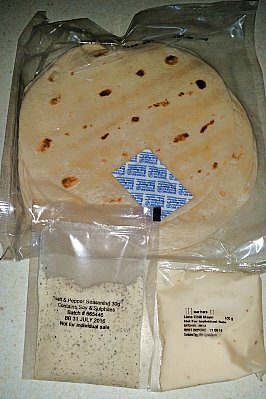 I have also used these wraps for home made tacos – we’re off the store bought packets as they have way too much sodium. 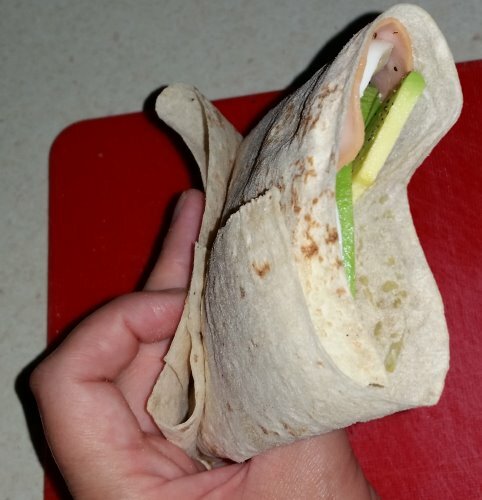 I used the Wattle Valley wholegrain soft wraps which are available at Aldi and Coles for these wraps, here is what the packet looks like. 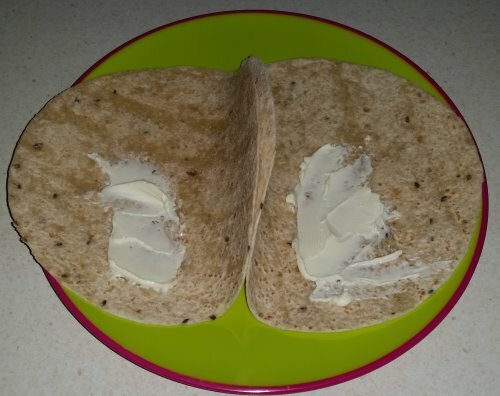 These wholegrain wraps are super delicious and I will be stocking up on them. 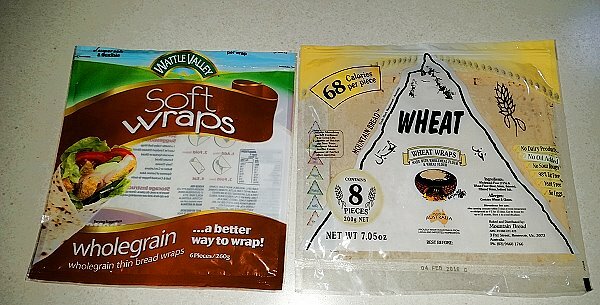 The other wraps I mentioned by Mountain Bread are square, so a little bit more convenient for wrapping in some ways. I can make them into a square sandwich, for The Other Half whose one complaint about moving away from bread was inconvenience.. 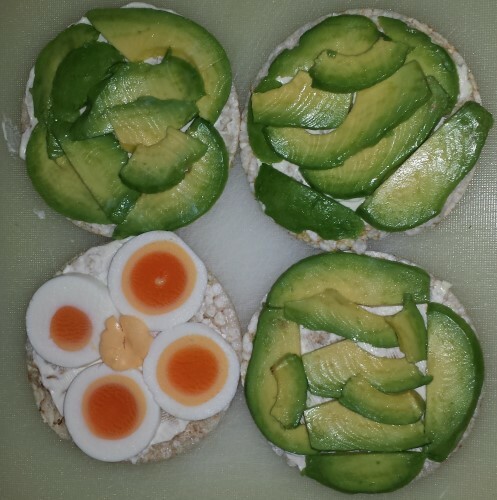 I gave them a try too – here is an egg, ham, avocado and cream cheese snack in the square Wheat mountain bread. To me, the most important function of any kind of wrap is staying together. 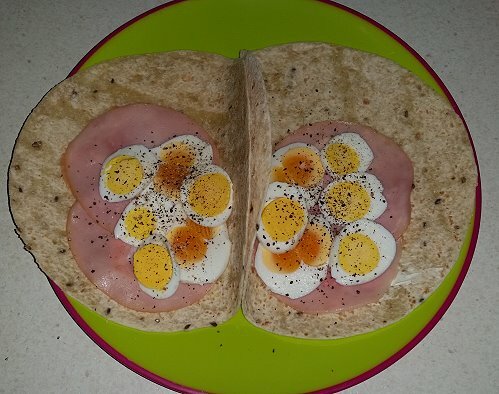 So for me this wrap was a bit of an epic fail. 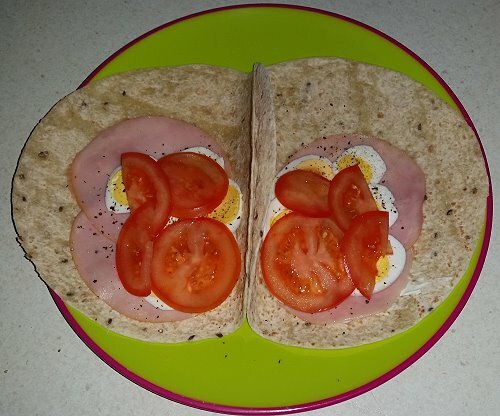 While the splits don’t matter so much with sandwiches for The Other Half who only likes to eat ham, cheese, egg and lettuce, it does matter a lot more when you are putting things that tend to drip – like tomato – into a wrap. I’ll try a few more of the Mountain Bread varieties to see if any of them are a bit more reliable, wrap wise. I do like that they have so few ingredients. 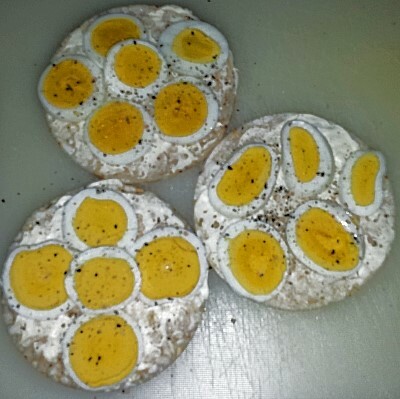 We’ve now had 8 fortnightly installments of Snoskred Snacks – this is the final one for 2015. This feature will return in 2016 though it will be less often, perhaps just once a month. I do still have some snacks which have not yet made an appearance here. It is now time to pay full respect to one snack I ate a lot this past couple of months. 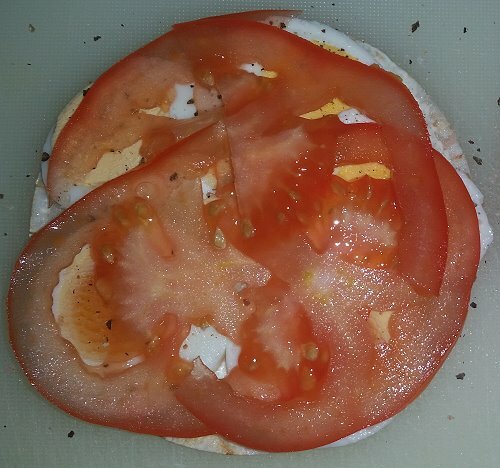 The very humble cream cheese, egg, tomato, ham, salt and pepper snack. There was a two week streak of this snack after my Avocado Incident. So how do we make this? I like to salt and pepper them up good. If I am feeling low on salt, I usually add some salt to the top of the tomatoes. I have low blood pressure and have been advised to make sure I get *enough* salt, VS The Other Half who has high blood pressure and has been advised to cut down his salt intake. Finally add your ham, and you are done-ski! There is something about this snack, these simple flavours put together really sing. You do need to be a little careful because the tomato can sometimes get a little drippy. 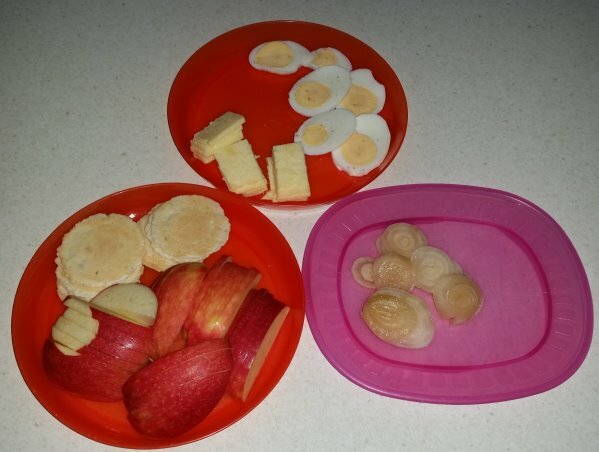 The best part about this snack – any leftover tomato or egg is taken out to the chooks. Chooks do like eating egg, this may come as a surprise to some of you. But even more than that, a couple of my girls really love tomato, one in particular deeply loves tomato seeds. On a chook level, there is a hierarchy of snacks. My girls love blueberries the most at the moment – any hint of blueberries and they all run up to me trumpeting. Watermelon and strawberries are next, then tomato, then egg, then cauliflower leaves or any kind of greens. If you give them an actual cauliflower they will peck it into an Alien Landform. They do not get sweet corn in summer because it raises their body temperature – that is their favourite winter snack. On a human level, this lunch snack is one of my all time favourites and in general will be made every second day. And now for something completely different, and a little bit posh. 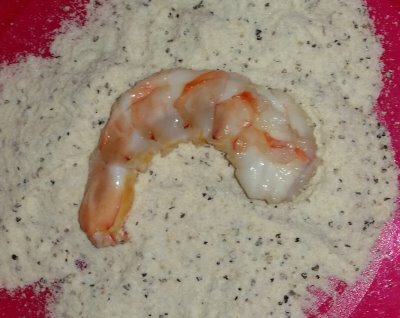 I’m going to talk about taking a dinner item and saving it for the next days snack, but in order to do this I need to tell you about the dinner, and a little trick my Chinese Aunt taught me involving prawns/shrimp. 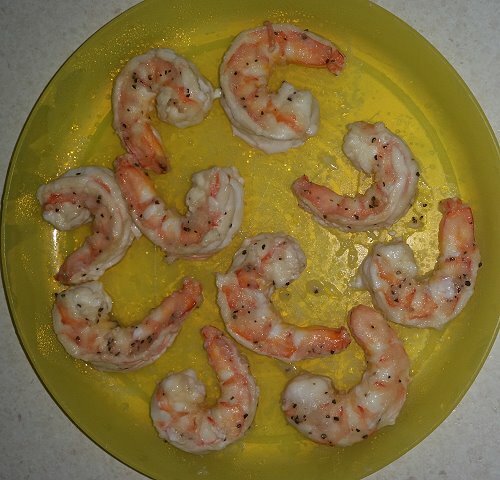 Be warned, you are about to see some uncooked shrimp here! So I took my Chinese Aunt and my Uncle to the fish shop a few weeks back when their car had been shipped to Adelaide and they needed to go shopping. 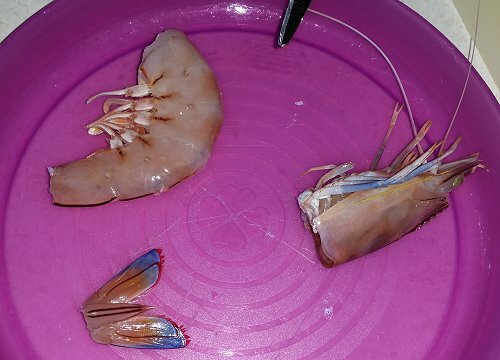 They had some uncooked prawns that were from Australia which had their shells. 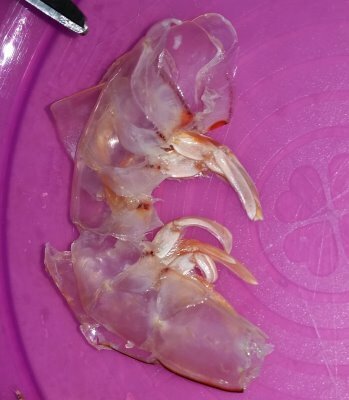 They had uncooked prawns completely shelled and de-veined which were from China. They were the exact same price. So after they moved to Adelaide and I had a prawn craving, I picked up half a kilo of large Aussie green prawns, having dishwashed my scissors beforehand so they were spotlessly clean, and I got to work. After they were shelled, de-veined and rinsed, I marinated them in some lemon and lime juice. I did the same with some chicken for The Other Half, then they all went for a quick dip into the salt and pepper seasoning. The pack seen above comes from Aldi – they have a Caesar one which we’ve had before and loved. 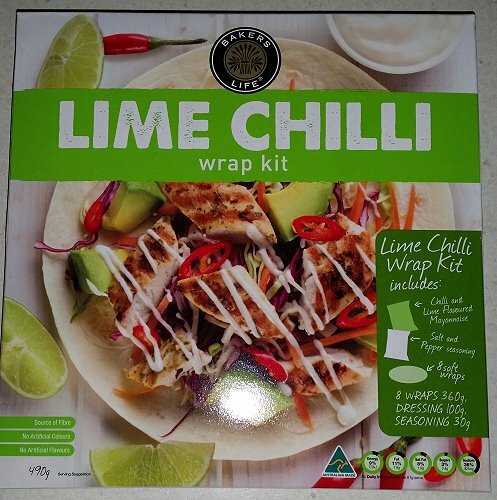 This was our first time with the lime chili pack. We would definitely have this again – they do a Peri Peri and I think kebab? pack as well which we will be trying eventually. However the Caesar one is our favourite thus far. After the marinade and the salt and pepper seasoning, the prawns and then the chicken were cooked in a frypan. 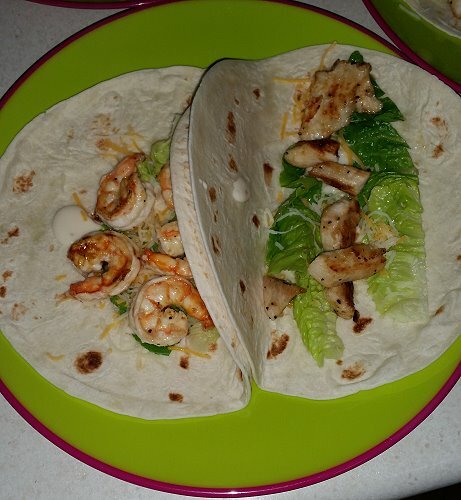 I cut up and washed some Cos lettuce, added some cheese, and dinner was served. I could have added tomato and avocado to these for myself however I am the only one who eats those things so I generally save them for lunches. This was pretty quick and easy. I had both chicken and prawns, and I saved some prawns for my lunch the next day. Here they are. And here is the lunch – I must say this happened during my two week no avocado time. 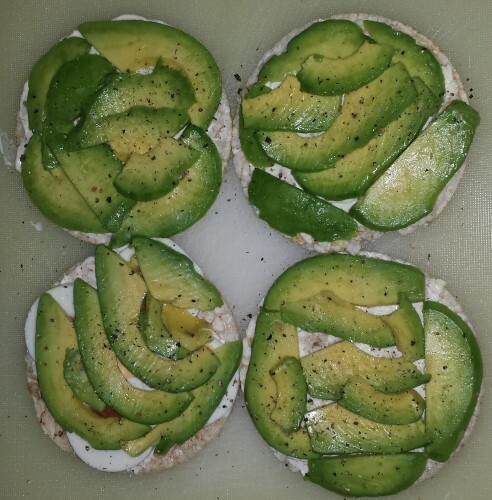 I would highly recommend using sliced avocado as the base for this snack. That is what I wanted to do, however, tomato it was. These prawns were super large so I only made 2 snacks this day. They were delicious! I will be trying this again with avocado soon. It is time to welcome my good friend the Avocado to Snoskred Snacks. Given my deep love for them it seems incredible to me that I’ve written 4 of these posts without them appearing! The Aldi avocados were not very ripe when I first started writing these posts, though I bought some not ripe ones and left them out on the counter for a few days to ripen them up. On this particular day I had a boiled egg left over from previous snack days, so I thought I would use it up and layer it under the avocado. I saved that snack right till the end to eat. On top of the avocado I generally like chicken or turkey. Aldi sells a sliced chicken and turkey. Both of these are “manufactured meat” products not fresh chicken breast and turkey sliced, which would be my first preference. However those things are more expensive, more difficult to seek out, don’t keep as long, and are not the kind of thing I would use for an every day snack. I would prefer to roast some chicken breast myself and slice it, and that might be something I look into given I just read the ingredients for these manufactured meat things when writing this post. *shudder* Nutritionally these slices are probably not awesome. The idea here is healthy snacks, so these might be off the menu for me in the future. I clearly remember my home ec teacher telling me “I’ve never once cut myself without looking at what I was doing and thinking “This is a really stupid thing to do” right before I stabbed myself with the knife”. For me it has always been the total opposite. I never, ever see my injury coming ahead of time. So in late October when I was making lunch on a Saturday, to discover I had actually stuck a knife through the avocado pit, through the outside of the avocado, and straight through my left index finger was an unhappy surprise. Do not fear, I will not show you any photos of the injury – instead I will show you a photo of the avocado with the knife still in it. This is some hours later after I got home from the hospital. Everything is very hazy to me about how it actually happened. I do remember looking down and seeing the tip of the knife sticking out of my finger and vaguely wondering what the heck it was doing there before realising I had cut myself. However the actuality of what had happened did not make proper sense in my brain for some time. Somehow – without thinking about it or perhaps in a panic- I removed the knife from my hand, and went over to the sink to rinse out the cut.I rinsed it out in the sink and then wrapped some paper towel around it thinking it wasn’t too bad. I was keeping pressure on the cut and it seemed like it had sealed nicely, no blood was coming out of the cut at all. But where was all the other blood coming from? It was then I realised the cut I was putting pressure on was the exit wound, and there was an *entry* wound on the other side of my finger. That is around the time I went into shock, waves of nausea were washing over me, and I felt like I was going to pass out. Knowing that this was a bad cut, The Other Half was out for the day with my car, and I would need to go to hospital for a tetanus shot and to have it cleaned out at a minimum, I called my parents right away. Mum arrived soon afterwards and off we went to the hospital. They took a quick look at the finger, bandaged it up nicely to await the doctor, and then asked when my last Tetanus shot was. I remember it clearly – when I was attacked by the dog at age 16, so over 20 years ago. Ok, you get a tetanus shot today. What a huge amount of fun that was, NOT. Back out to the waiting room, to wait, for about 2 hours. Then I got called back in and seen by two doctors who could not figure out how I had managed to do this. They were trying to tell me this was not an entry and exit wound but two completely separate cuts, because I would have hit bone if this was a puncture wound. I ended up having to draw the knife for them and I wished I had taken a photo of the knife before leaving home. There is a tip for your next emergency room visit. :) I explained this was a filleting knife and it was entirely possible it had hit – and cut – bone on the way through. The blade was facing the bone. Oh, you’ll need an x-ray then. Back to the waiting room to wait for the x-ray porter, who arrived maybe 30 minutes later, x-ray done, then another long wait, then I was called in and told nothing was seen on the x-ray, no need to clean out the wound, it will be fine because I washed it myself and because I had been waiting so long it had started to heal already, and they put on a band-aid. I could have done that myself at home. In fact I probably could have just kept pressure on it and then put a bandaid on and it would likely have been fine but I figured that when you stick a knife *through* your finger, that is potentially a serious injury and requires medical attention. Around here there are no doctors open on the weekend, so that means a hospital trip, and I don’t have any tetanus shots at home. It was an incredibly stupid thing to do, and the wrong knife to be using for this particular job. I’m usually fairly good with my knife skills – obviously, considering I have gone over 20 years without a tetanus shot. The good news is, the tetanus shot hurts far more than the cut ever did. The cut had entirely healed over before the huge lump in my arm from the shot went away. 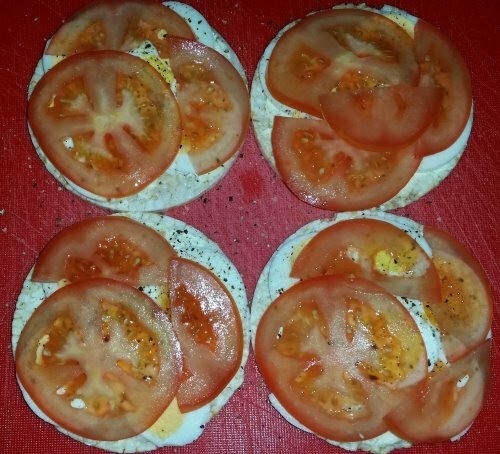 As mentioned in Snoskred Snacks 3, this time we are going to put something else on top of the tomatoes. What could it be? 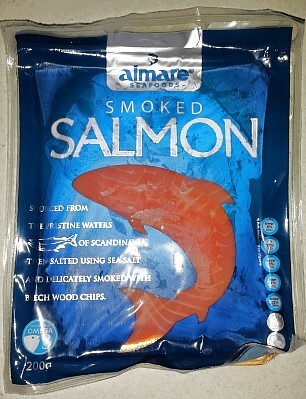 Aldi have this Smoked Salmon for $6.99 for a 200g packet. In most other supermarkets, you’d get 50g for that kind of money. 200g is usually $10 or more, though on occasion you can find it on special for slightly more than you pay for this Aldi version. I’ve tried all the versions and the Aldi one is excellent. 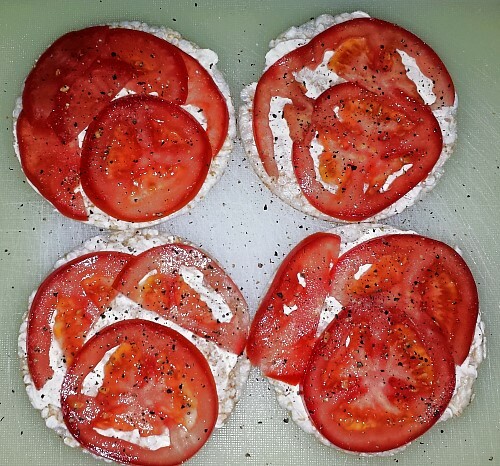 I’ve made this snack on toast with the tomatoes grilled before in winter, and I quite like that as an occasional snack. However you cannot toast a rice cake, because bad things will happen. At least, it says so on the packet and I have no intentions of testing this out, thanks to That Terrifying Incident With A Fruit Muffin Where I Took Out All Phones And Computers In The Call Centre, For Two Hours In The Middle Of A Work Day, Thus Rendering The Call Centre Completely Inoperable. I do not recommend this as a daily snack, but once in a while the smoked salmon is a lovely change from the ham. What do we have hidden under the ham today? 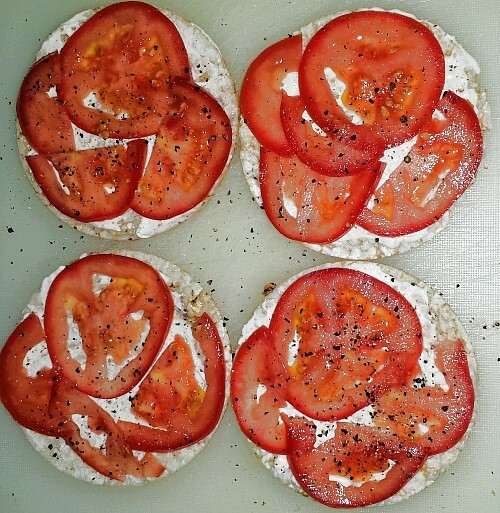 Cream cheese spread and Tomatoes! I have also added mustard to this in the past. I should take a moment to talk about the cream cheese spread. 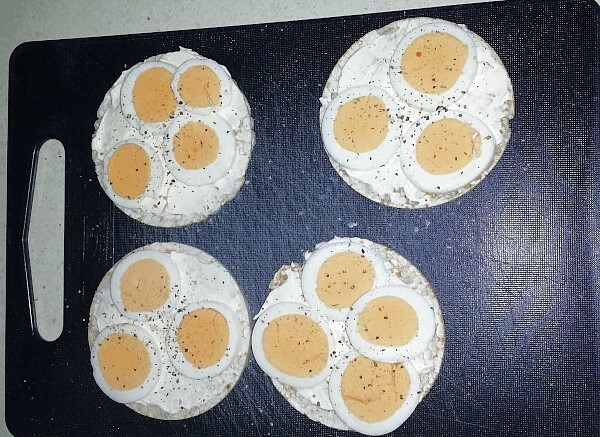 Aldi make two versions – a regular and a lite. I’ve used them both in my No Bake Cheesecake recipe – to me they taste almost identical but the lite one is less dense. 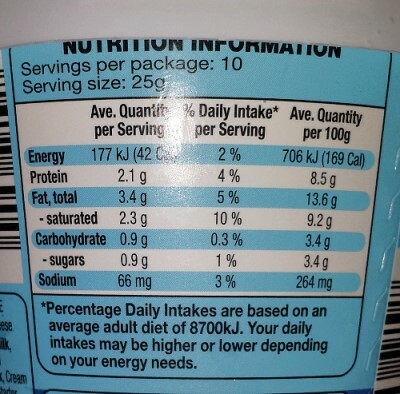 For those who like to read the nutrition panel, this is for the light one. :) Me personally I probably get 15-20 servings per container. I do not like to spread it very thickly. I just want to get the flavour of it, not drown in it with every bite I take. :) If you do not like cream cheese spread but you still want to spread something on the rice cracker, I suggest Hommus or maybe smashed avocado. You could stop with the tomatoes if you wanted to. I always like to salt and pepper my rice cake snacks well because I find that brings out the natural flavour of whatever has been placed on top. So a word about ham and nutritional info. Alternatively, a slightly embarassing Snoskred story. We’ve been enjoying this Don ham. 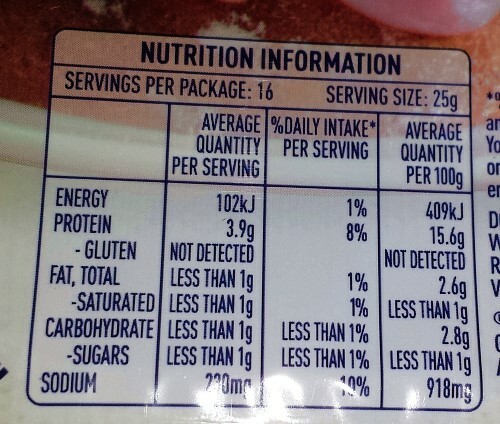 One day I read the nutritional info on the packet – which looks like this. 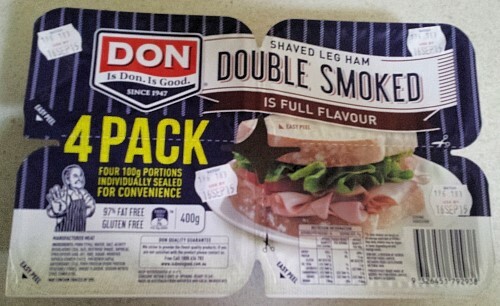 Having used several of these packets previously, I know in each packet there are 12 slices of ham. How can I divide 12 slices into 16 serves, I thought! How ridiculous, I thought. They are really trying hard to hide how much sodium is in this stuff. 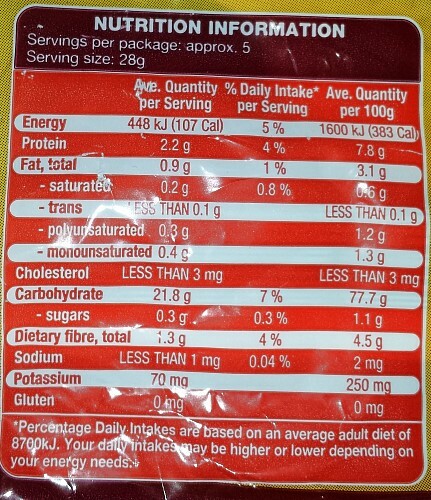 Then I arrived back at my computer with photos, and realised they mean there are 16 servings in the 4 packets. 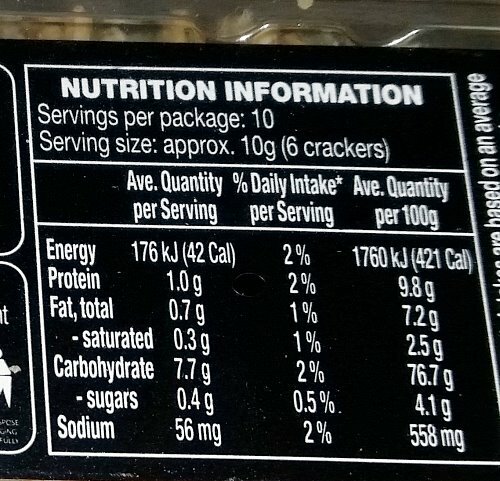 I’m no genius, but I would suggest if you are making 4 packets of 100g, you should probably give the nutritional info for each *packet* of 100g. Not many people are going to eat all 4 packets at once. So, all this to say, 3 slices of ham = 1 serving. And that will give you 10% of your daily required sodium intake. That is fine for me because I have low blood pressure and am actually supposed to ingest more salt according to my doctor. For the other half, with high blood pressure, this ham is not so great. I’ll have to do some packet comparisons on future shopping trips. But we love the taste of this one. 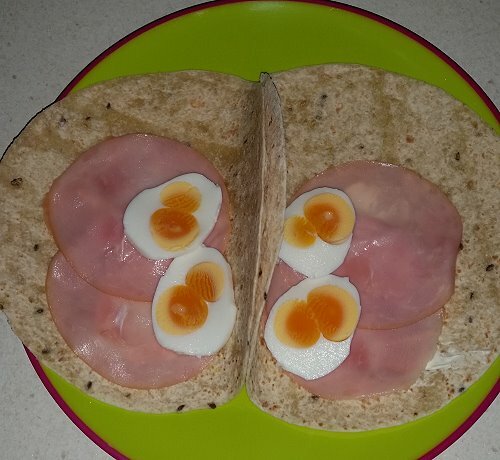 Last month I told you about my Egg and Ham snack. In mid-August there came a time where I ran out of eggs. Bizarre a concept as that may be when one owns chickens, the fact remains that I had eaten too many eggs for most humans in just over a week. I was still craving them, and it was another week before the grocery shop. I decided it was time to lighten things up a little. In the fridge, I had some strawberries. And thus, my new snack craze was born. 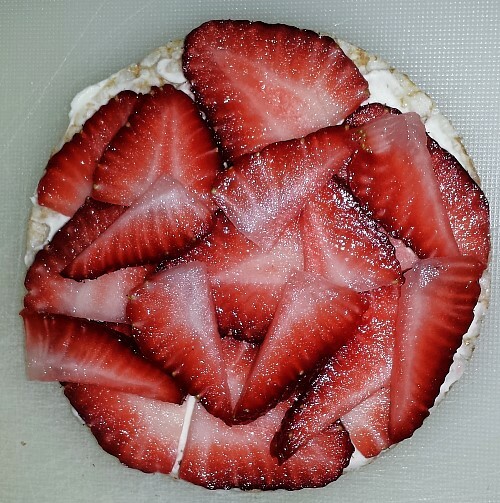 Thin rice cakes topped with cream cheese and strawberries. On this occasion the strawberries were super tart, so I added a sprinkling of sugar – the sugar meets the surface of the strawberries and turns into a sweet syrup. So let us take a moment to talk about rice cakes. I like the ones from Aldi. Me personally I get somewhere between 6-10 servings out of each packet. 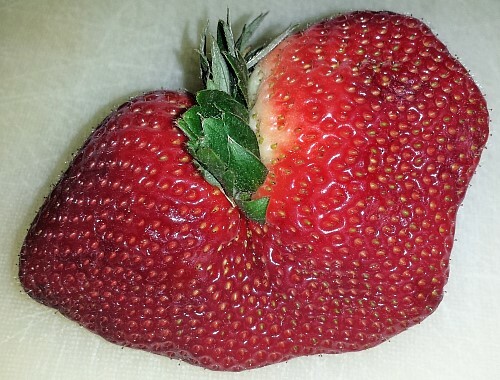 Sometimes when I am not so hungry I will just make 2 – that usually happens when I am having strawberries on them as a dessert. 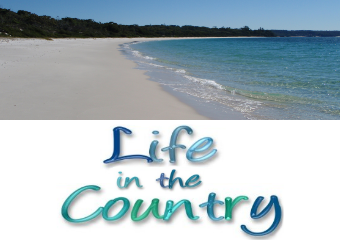 My friends, it is now Spring here in Australia. This means it is time for Snoskred to break out the spring-y and summer-y snacks. Over winter, for lunch I want something hot. I tend to get in a little food rut, eating one snack for two weeks at a time and then switching to another snack. This winter I rotated between bolognese sauce over potatoes, various kinds of soup with cheese and crackers, my little Red Curry friends, fresh mushroom soup, Vilis pasties with cheese and croissants with ham and cheese. Dawn has been talking about finding new snacks over at it just Dawned on me… and I remembered some snacks I ate quite a lot last spring and summer. Then I thought maybe I should make a new – semi-regular – feature on my blog for spring – and maybe summer – where I share some of my favourites with you. Lite N Easy taught me that bread and I are not especially great friends. I don’t mind the odd sandwich or grill from time to time but I had to find a non-bread option. I find crackers ok but generally dry *and* difficult to fit much onto. I also gave Cruskits another try but found them a bit too crunchy for me. Someone at work suggested trying a rice cake and YAY I found my new snack friend. 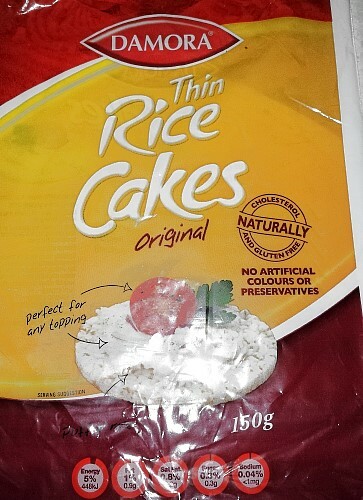 After a bit of experimentation, I prefer the thin rice cakes. Aldi makes one which I usually buy. 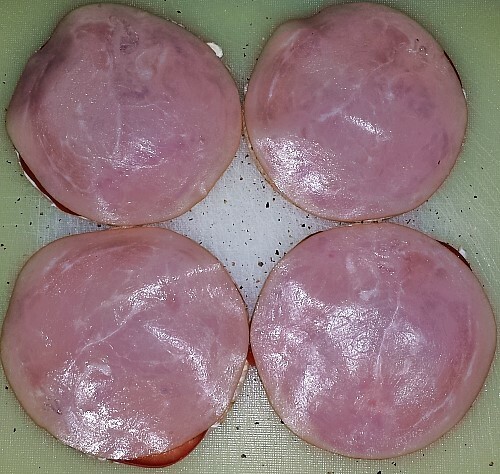 So if you saw the photo at the top, you might think that was just ham on top of a rice cake. The ham on top is my special secret signature move which I discovered as a surprise to myself. 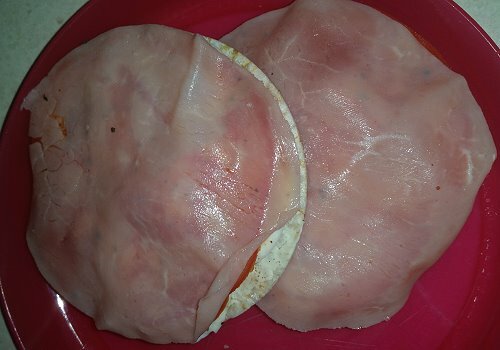 One day, I was making my rice cake snack and totally forgot to put the ham on.. but I still wanted the ham, so I put it over the top. I discovered that doing this was a great way to keep the toppings on top of the rice cake rather than having parts escape. 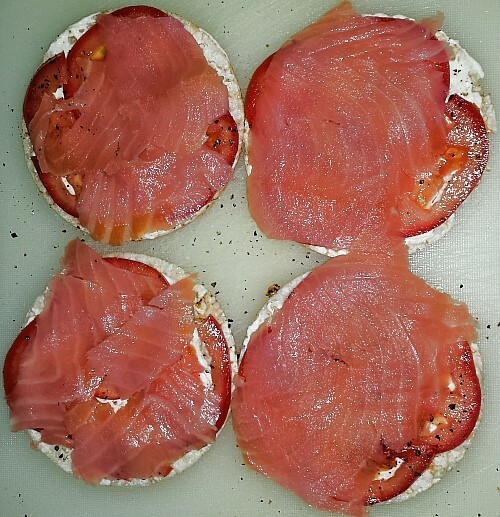 I have been layering a slice of something – ham – chicken – turkey – smoked salmon – over the top of my snacks ever since. 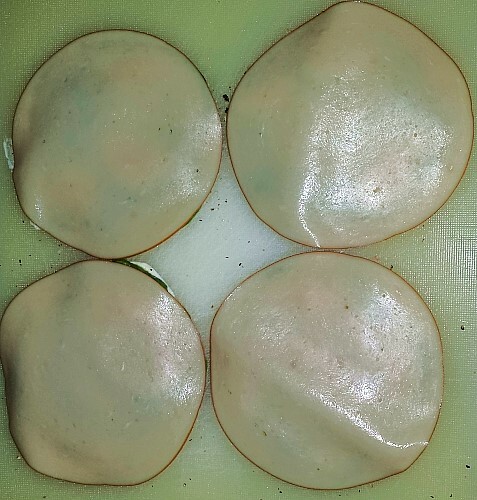 Rice cakes are round, my sliced meatgoods are also round, it is a perfect fit. First up, make some hard boiled eggs. You can do this the day before if you like. 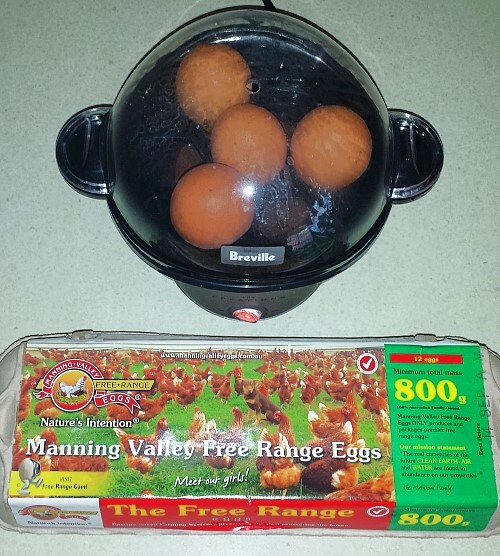 If my girls are not laying enough eggs for me, I buy the Manning Valley free range eggs. You can watch the hens online here. 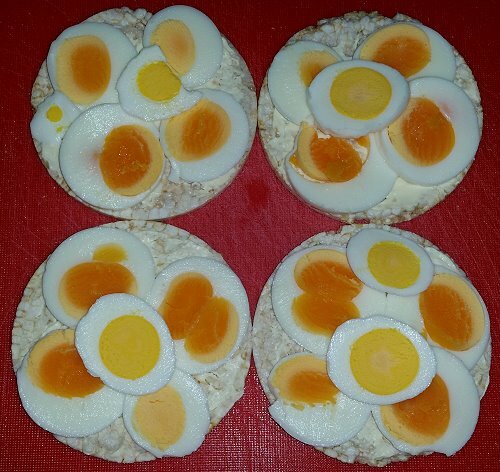 Peel the eggs, and slice them. 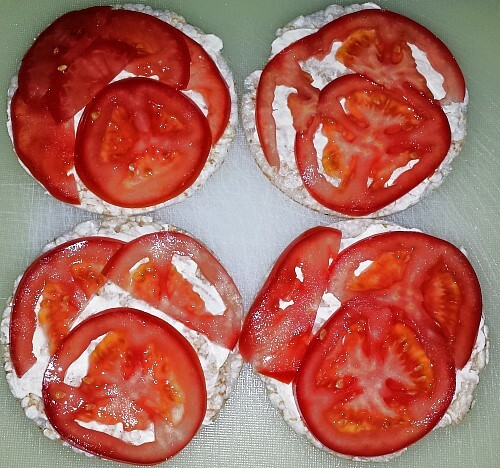 Spread cream cheese onto the rice cakes. 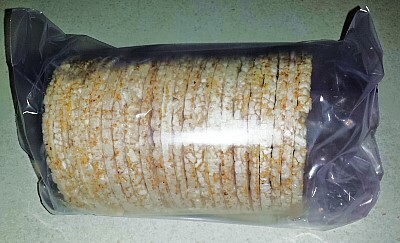 This part is quite tricky as these rice cakes are very thin and you can crack or break them if you push down too hard. You can choose another kind of spread if you prefer – hommus would be my second choice. 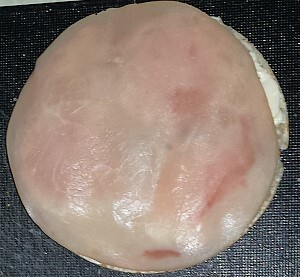 Then lay your ham on top, and you have your snack all ready to go.